Randy Briggs of Redlands, owner of Coops Coins in Redlands, was awarded a 50-year membership pin by the American Numismatic Association at the organization’s 126th-anniversary banquet and awards ceremony Friday (Aug. 4) in Denver. Briggs was one of 10 such awardees in attendance at the ceremony, which was part of a five-day conference for numismatists (people who collect coins and paper money). Two men in attendance received 70-year membership pins. Briggs attended the ceremony with his wife Lauren, who co-owns the shop. “This recognition shows he is devoted to the hobby, and not just to the hobby, but to the association and to promoting numismatics,” said Cary Hardy, the ANA membership director. According to Hardy, the ANA was founded in 1891 and has about 24,500 members. Headquarters is in Colorado Springs, where there has also been a money museum since 1967. While Briggs was at the conference, he bought an 1836 Gobrecht silver dollar, which he will put on display in his shop. Only 1,000 were made, and those were during a 36-year period starting in 1804 where no other silver dollars were minted. Its value is about $11,000. “I like to buy an extremely valuable coin every once in a while so my customers have a chance to see it,” he said. 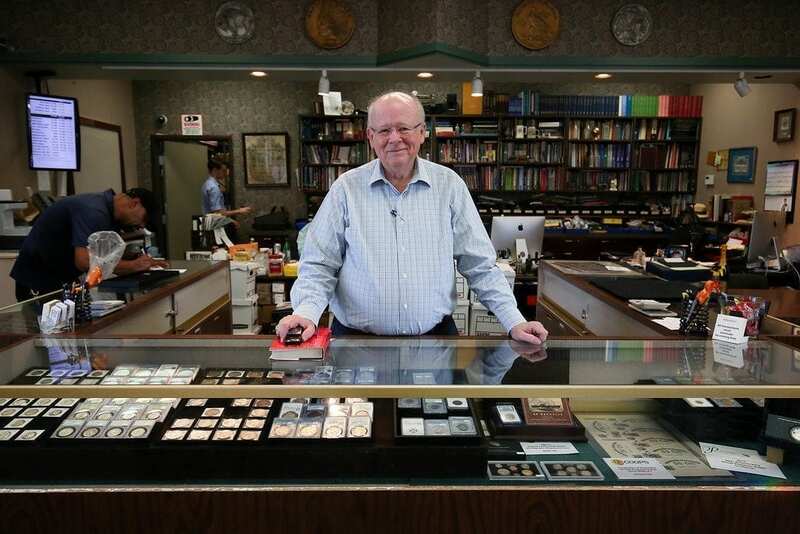 “This one is exceptional because it’s rare in numismatics.” Coops Coins is at 21 E Redlands Blvd. in Redlands.